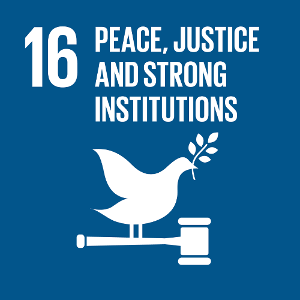 Beside peace and justice (with the KPI intentional homicide offences), SDG 16 promotes effective, accountable and transparent institutions. The indicator trust in institutions broken down by the three main types of institutions — police, legal and political system — provides insights into their perceived performance. 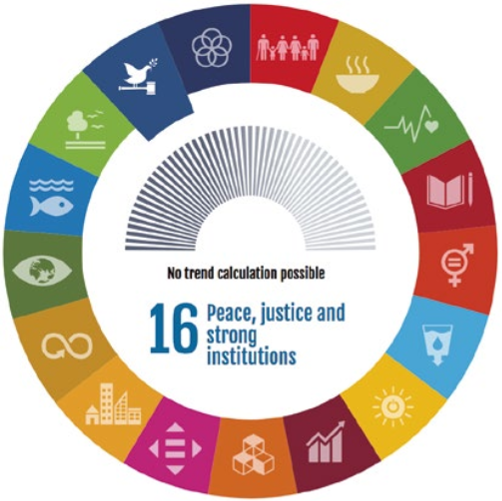 A similar indicator on ‘good governance’ referring to citizens’ confidence in EU institutions is also used for monitoring the EU Sustainable Development Strategy. The European Commission published in February 2018 country-specific factsheets to supplement the latest Eurobarometer surveys looking at public attitudes to corruption and businesses’ attitudes to corruption, published in December 2017. The factsheets contain breakdowns of key results by Member State, comparing these with results from previous surveys, as well as with the EU average. When it comes to public attitudes on how widespread the problem of corruption is in Croatia, factsheet indicates that 94% respondents think that corruption is widespread, in comparison to 68% of respondents in EU28. Also, 59% of respondents in Croatia agree that they are personally affected by corruption in their daily life, unlike only 25% of surveyed in EU28. Giving a gift (50%) and doing a favour (43%) are the two most acceptable things to do if someone wanted to get something from public administration or a public service, which is far less acceptable on EU28 level with 21% and 22% respondent considering that it is acceptable to give a gift and to do a favour. Political parties, politicians at national, regional and local level and the courts (tribunals) were identified as the three main sources of giving and taking bribes and the abuse of power for personal gains in Croatia, similar as in EU28, at least when it comes to political parties and politicians at national, regional and local level. However, there is a sharp difference in assessment of the courts, with 58% of respondents in Croatia and 23% in EU28 who evaluated that bribes and abuse of power are widespread among tribunals. Only 4% of Croatians reported corruption, four times less than in EU28, where 18% reported corruption. For 58% of respondents in business and corruption survey corruption was identified as a problem, with fast-changing legislation and policies (85%) being identified as the biggest problem of doing business in Croatia. Similar to public attitudes, 92% respondents agreed that corruption is widespread in Croatia, in comparison to 67% respondents on EU28 level. Business respondents also identified “funding political parties in exchange for public contracts or influence over policy making” as the most widespread practice in Croatia. Austrian factsheet on public attitudes indicates that 50% of respondents think that corruption is widespread, less than in EU28. Austrians also don’t feel that they are that much personally affected by corruption in their life, with only 18% agreeing and 80% disagreeing about the influence. Similar to Croatia, political parties and politicians at national, regional and local level were identified as two main sources of giving and taking bribes and the abuse of power for personal gains, with officials issuing building permits identified as the third major source. As in EU28, 18% of Austrians reported corruption. In Austria, corruption was a problem for 38% of participants in business and corruption survey, similar to EU28 level with 37% of participants, while the tax rates were identified as the biggest problem. That problem of corruption is widespread in Austria thought 56% of respondents, who also identified “favouring friends and family members in business” as the most widespread practice (47%).